Size: * 12 oz. 27 oz. 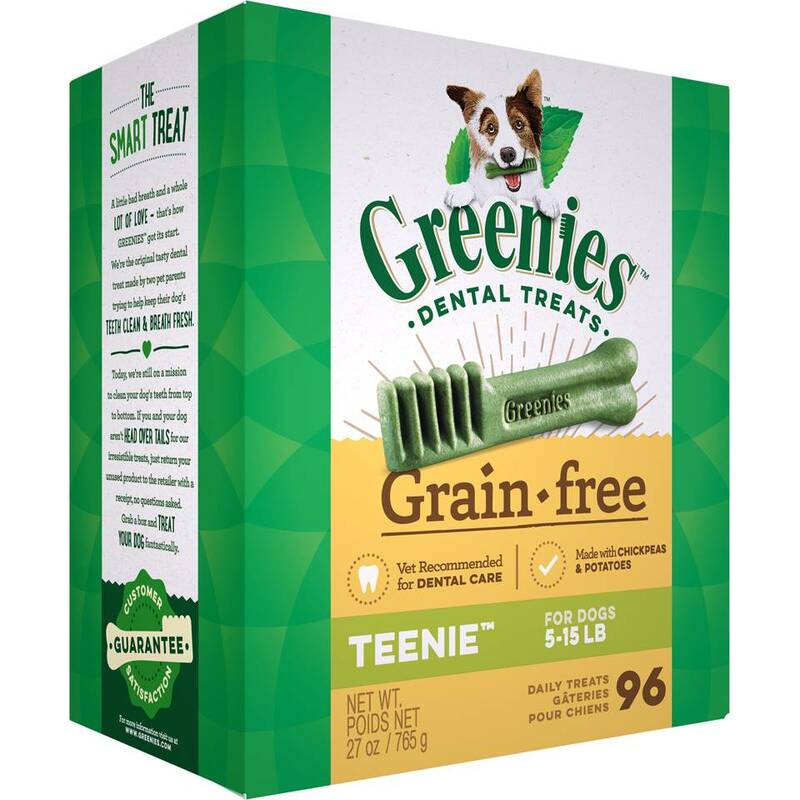 GREENIES™ Grain Free Canine Dental Chews are proven to clean dogs’ teeth by fighting both plaque and tartar buildup, freshening breath, and maintaining healthier teeth and gums. 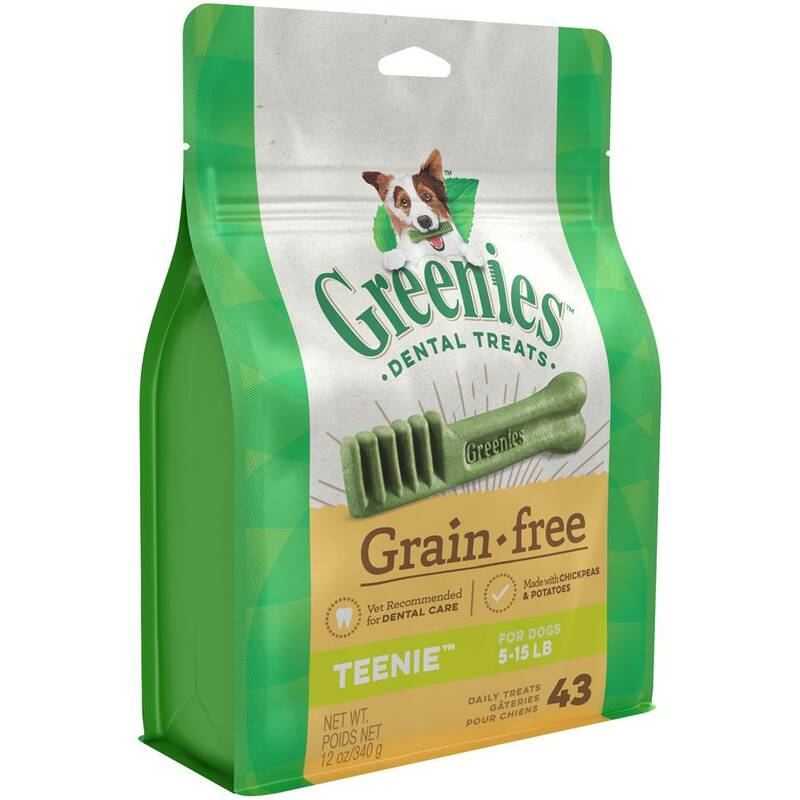 Our new Grain Free Chews are formulated with chickpeas and potato for a more natural diet, making these low-fat dental chews perfect for daily treating. Dried chickpeas, gelatin, glycerin, powdered cellulose, dried potato, water, lecithin, potato protein, natural poultry flavor, minerals (dicalcium phosphate, calcium carbonate, potassium chloride, magnesium amino acid chelate, zinc amino acid chelate, iron amino acid chelate, copper amino acid chelate, manganese amino acid chelate, potassium iodide), choline chloride, dried apple pomace, fruit juice color, vitamins ( dl-alpha tocopherol acetate [source of vitamin E], vitamin B12 supplement, d-calcium pantothenate [vitamin B5], niacin supplement, vitamin A supplement, riboflavin supplement [vitamin B2], vitamin D3 supplement, biotin, pyridoxine hydrochloride [vitamin B6], thiamine mononitrate [vitamin B1], folic acid), turmeric color.